World news on the cheap in Cairo November 2011: who speaks English here? WORLD NEWS ON THE CHEAP like yesterday a Dutch crew of the television news (NOS/NTR Nieuwsuur) in Egypt doing ‘street interviews’ and proving that the support for the Egypt Revolution is faltering with two third of those interviewed speaking some form of English and only one or two questions posed in Arabic, whereby it remains unclear who is posing the question. Gone are the days of a correspondent in Cairo for the Arab world, gone are the days of at least having a journalist speaking Arabic being part of a crew, gone is any historical knowledge on the part of the journalists, at best a quick check of Wikipedia before leaving or in the hotel room…. 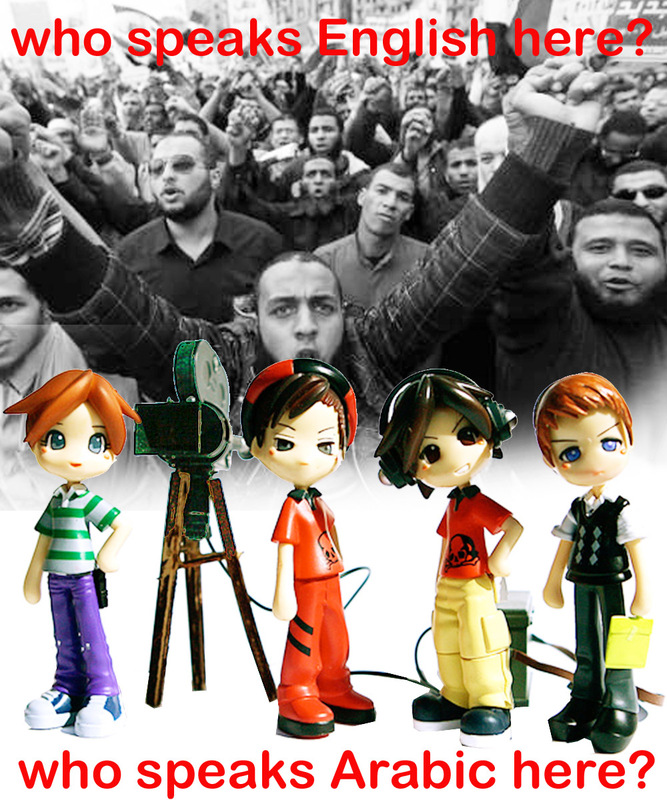 as a multi-cultural nation it is a shame that the Netherlands have not been able to train and recruit a group of say Moroccan young students to become journalists for events in the Arabic world…. “Who speaks English here?” asks the camera crew on Tahrir Square in Cairo untill they bump into a man that does not like the way they are filming… and when people on the street might return the question to them (hal tatakallam al-lughah al-‘arabīyah?) 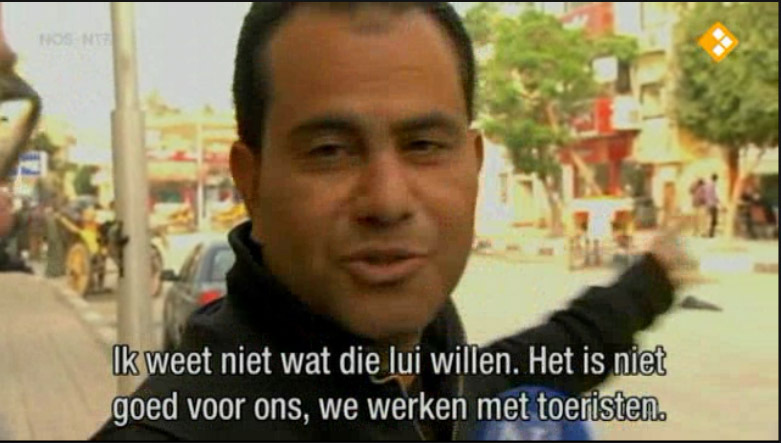 هل تتكلم اللغة العربية؟, the Dutch journalists of the crew fail to understand. There seems to have been a translator with the crew, but the position of the translator remains unclear. The tiny bit of Arabic we hear spoken from the side of the crew seems clumsy, was it a Dutch Arabic speaker or a locally rented service. If the last thing is the case, how much embedded is this translator in the Egyptian state media, how does the translator relates to the political spectrum of Egypt, how were the choices of who to speak to made? The clumsiness of the reportage is at times embarrassing, but fully in line with the cheap glamour of the Nieuwsuur television studio in the Netherlands and the anchor woman waving her hairs while posing question to the crew in Cairo to enlighten the Dutch audience. 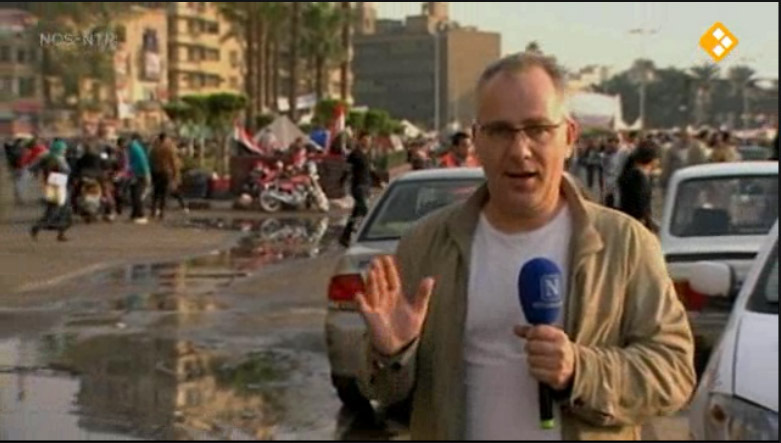 Nieuwsuur (NOS/NTR) reporter Jan Eikelboom explains how he found out that the Egyptian revolution is faltering on the basis of "hear say" from the streets, speaking with shopkeepers in the bazars, tourist entrepreneurs and a man at the Cairo stock exchange, they outcome of these talks are of course fully predictable, as all these people see their business frustrated by the social unrest. Shopkeepers, tourist workers and a broker can of course not stand as a representative group for Egyptian society as a whole... but the Dutch crew clearly had no access to other social layers. (19':50'') Dutch captions for a tourist entrepreneur in Giza interviewed in English: "I do not know what those people want. It is not good for us, we are working with tourists"
(20':38'') Dutch captions for an interview in English. "On the square they say: We want peace." Actually the reporter says not 'peace' but 'freedom'... sloppy translator there, at the NOS/NTR... The over-generalized question may have been posed in English by Jan Eikelboom and the answer is as general as the question: "...freedom will come, but slowly."